HONOLULU — Four malnourished Hawaiian monk seals have been taken from remote atolls to a Big Island hospital for the endangered animals to be fed fish and fluids to boost their weight, officials said Thursday. 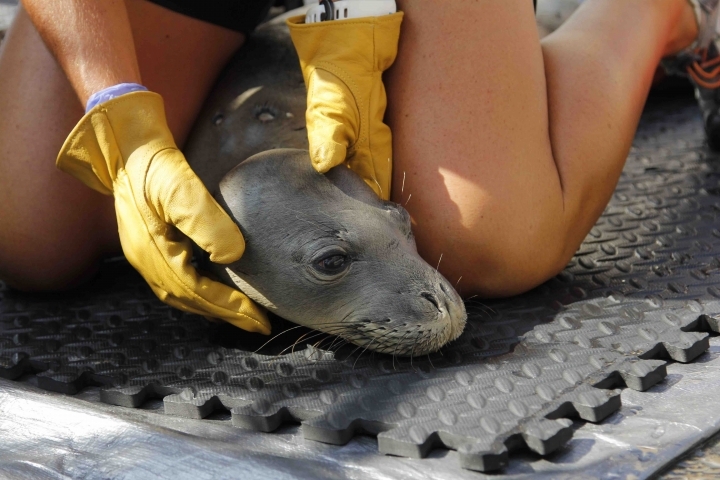 The seals are likely to stay for at least a few months while they gain strength, said Dr. Shawn Johnson, chief veterinarian at the Marine Mammal Center, a California-based nonprofit which operates the hospital in Kailua-Kona. The seals will be taken back to the Northwestern Hawaiian Islands when they are healthy and officials are able to arrange a ride for them. Two of the seals were prematurely weaned by their mothers. One is a yearling, and the fourth is an extremely underweight five-year-old. Three of the animals are females. Only about 1,300 of the animals remain in the wild and their population in the isolated Northwestern Hawaiian Islands is declining about 2 percent a year, said Charles Littnan, lead scientist for the Hawaiian Monk Seal Research Program at the National Marine Fisheries Service. He hopes nursing malnourished seals back to health will help stem the decline. 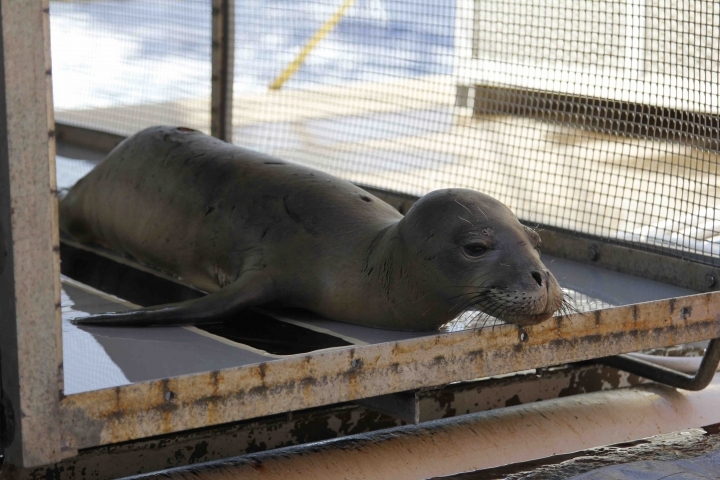 Construction of the monk seal hospital two years ago has given officials treatment options they previously lacked. "All of these pups and young animals would have been left behind in the past and almost certainly would have died," Littnan said. 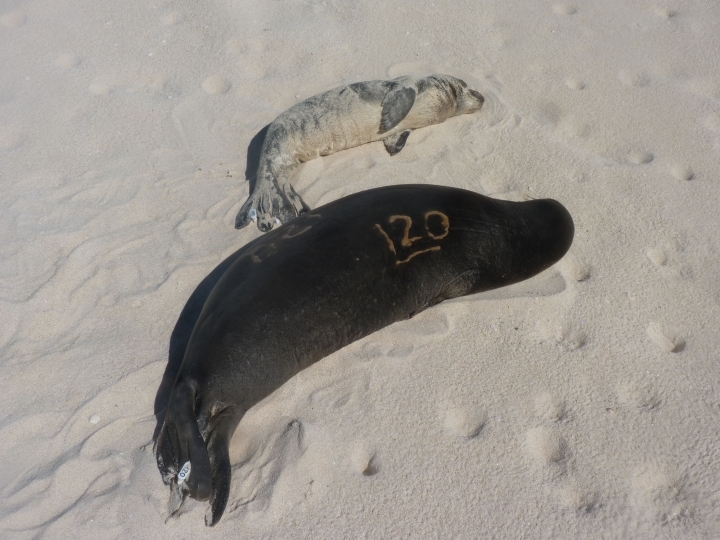 Over time, Littnan hopes the rescued seals will help boost the seal population by reproducing. The youngest seal, a male pup born in the spring, is so weak he's being fed with a tube, Johnson said. The veterinarians are giving him a mixture of mashed herring, salmon oil and vitamins five times a day. The others are eating thawed frozen herring. Each seal is getting a full medical exam to determine whether they may have an underlying condition causing them to be malnourished. Some pups born in the Northwestern Hawaiian Islands have struggled to compete for food with sharks and ulua, or jack, that are plentiful among the remote atolls. This has contributed to a lower survival rate for the seals there compared to the Main Hawaiian Islands. Biologists captured the four seals during a trip this summer. A research vessel took them to Kailua-Kona on Wednesday. Last summer, researchers brought back six seals from the remote island chain and one seal from Niihau island. Fewer seals needed help this year, Littnan said.